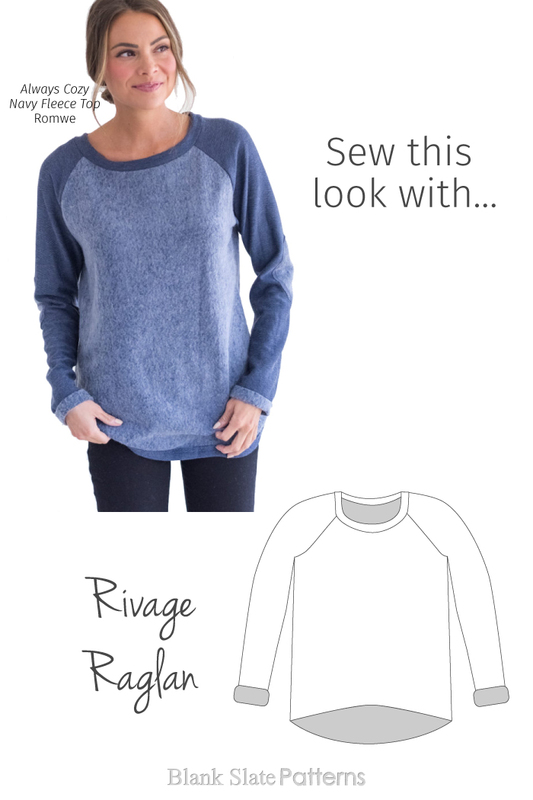 It would be easy to use the Rivage Raglan pattern to recreate this look. Straighten out the hemline on your pattern piece. Use a sweatshirt fleece or french terry knit for the pattern, with the wrong side for the main body pieces. For the sleeve and body hems, turn the fabric to the right side of the garment instead of the wrong. For the diamond-shaped elbow patches, sew those onto the sleeves while flat! The ones on here are a good size — I’d say you could make the patch width about 40% of the width of your sleeve at the elbow, and a little taller than wide. If you want to double-check the placement of the patches before final stitching, pin or baste them in place after step 2 on page 11. Then, sew step 3 with basting stitches, try the garment on, then adjust if needed.